For background information about Japanese anime (animation) and manga (cartoons or comic books), click on Viz Communications, then scroll to "Going Global." We suggest you also read the "Anime" section of Your Comments and our Answers to Pokemon mail. The section below has notes offered as a warning to Christian families. "Dragonball, written by the world-renounced Akira Toriyama, is an epic story of good versus evil...."
"In Toriyama's original work, merely called "Dragonball", the main character, Son Goku, is a super-strong, little boy who also happens to have a monkey-like prehensile tail attached to his backside." Notice the interesting tie to the animal world. The shaman or "Medicine man" in earth-centered cultures around the world would often wear animal masks, horns, tusks, feathers, or fur in order to invoke a corresponding animal spirit. "... he spent his early years living alone in the mountains, fending for himself. One day, a pretty, young girl named Bulma arrived in the area and introduced him to a grand adventure - tracking down the seven magical Red-Star Dragonballs, that, when brought together, call forth Shen-Lon the Eternal Dragon, who would then grant the summoner a single wish. After the wish has been granted, the seven Dragonballs scatter until the next time they are brought together." The ritual of gathering the Dragonballs empowered the winner to invoke a personified spiritual being. No longer are children merely looking to impersonal psychic forces. This is a personal deity, which like Satan, masquerades as a benevolent god -- or as the helpful genie in Aladdin's magic lamp. "The rest of the first series shows little Goku fighting an odd assortment of strange and/or hilarious baddies, making new friends, summoning Shen-Lon, and slowly growing up." "The manga for this series is a collection of sixteen tankoubans (graphic novels), and through the course of them, Son Goku would "participate in three martial arts tournaments, encounter and defeat an army bent on taking over the world, and build lasting friendships with the people around him - many of which, surprisingly, were former enemies." Remember, "manga" refers mainly to the comic books, which link the psychic powers and cosmic battles of the power behind martial arts. 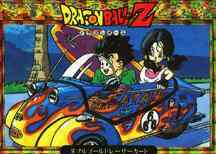 "The second series, "Dragon Ball Z," picks up years after the end of "Dragonball". By now, Son Goku is an adult and married, with a four-year-old son named Son Gohan. In the first set of episodes, aptly termed the 'Saiyan saga', we uncover the secret of the Son family's unique tail (which has since been lopped-off on Goku)."